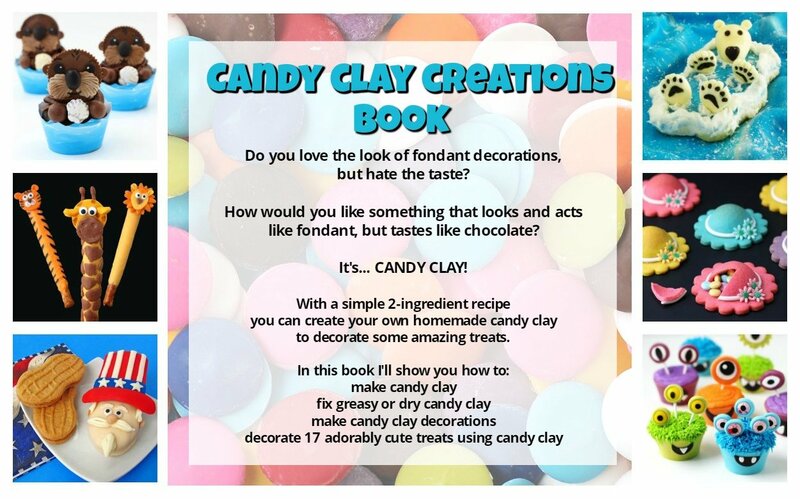 Candy Clay Creations is a 102 page book available in printed or e-book format that will guide you through the process of making and working with candy clay. You’ll be amazed at what you can create using a simple 2-ingredient recipe. If you have never made candy clay before, you are going to love it! It looks like fondant but tastes like chocolate and is so easy to use to transform plain desserts into extraordinary treats that your family and friends will love. 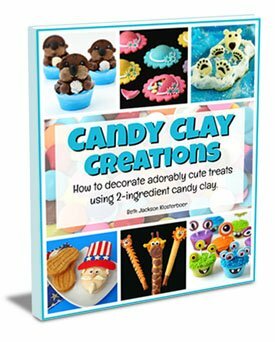 I am excited to share all the candy clay making tips and tricks that I have learned in over 30 years as a chocolatier with you in this 102 page book. The printed book is available on Amazon.com for $24.99. Thee e-book is available through E-Junkie for $19.99. Candy clay is a simple 2-ingredient recipe. 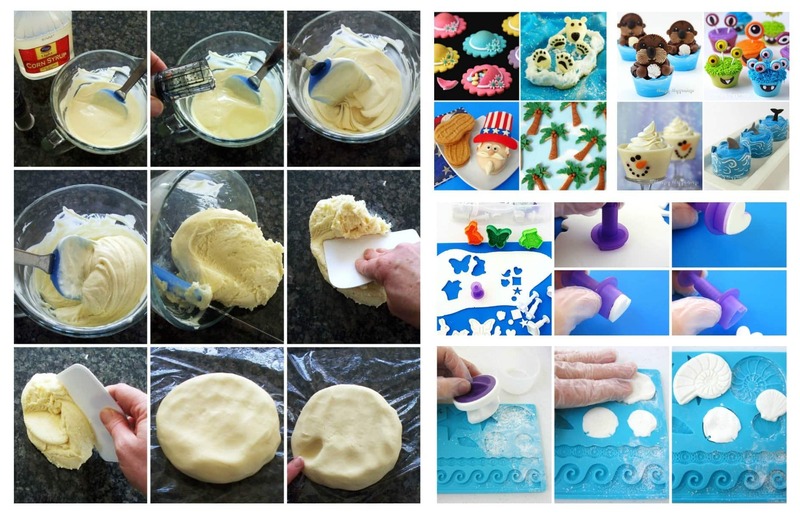 By combining candy melts (or chocolate) and corn syrup you end up with a play-dough-like edible treat that can be used to decorate cupcakes, cookies, Rice Krispies Treats, pretzels, and more. Candy clay is soft and pliable enough to cut, sculpt, extrude, and mold yet it firms up as it dries so that your edible decorations hold their shape until they are eaten. Just like chocolate, candy clay will soften and melt once in your warm mouth so it feels silky smooth on your tongue. So go ahead and create that sculpted figurine to stand on top of your cake. It will hold it’s shape beautifully. Your party guests will not only enjoy how it looks but they’ll love how it tastes. Unlike fondant, candy clay decorations are meant to be eaten and they taste great. Making 2-ingredient candy clay is quite simple but even with the easiest recipes, things can go wrong. When I first began making candy clay years ago, I was frustrated because sometimes it would be perfect and other times it would be greasy, dry, crumbly, soft, or hard. It took a lot of trial and error to figure out the best way to make candy clay so that it’s smooth and pliable every time. Along the way I also came up with solutions to fix all the issues I once had and I share them all with you so that you don’t have to go through what I went through. If you follow my instructions your candy clay should be perfect every time. If you’ve had trouble with greasy, dry, or hard candy clay in the past then this book is for you. If you’d like to learn how to cut, sculpt, mold, and shape candy clay decorations, I have wonderful tutorials with lots of pictures to guide you through the process. If you want to learn how to make tasty treats that will “WOW” your family and friends, I’ll show you 17 step-by-step tutorials for making and decorating cupcakes, cookies, cereal treats, snack cakes, pretzels, and even caramel apples. $24.99 in the printed book. When you click the button above you’ll be able to purchase the e-book for $19.99 using PayPal or a credit card. Once you’ve paid, you will be able to download the e-book. You will also receive an email message with a link to the book, so you can access it at any time (a maximum of 5 times). Get the printed book for $24.99 from Amazon by clicking the picture link below. After you’ve purchased the book don’t hesitate to reach out to be with any questions you might have. Also, be sure to share pictures if you recreate any of the candy clay projects. I’d love to share them in my Readers’ Gallery. Thanks for making a purchase.